Many people use the iPhone’s Health app or their Apple Watch to measure their steps or the distance they’ve walked during the course of the day. You may not realize, however, that it can measure much more than that. With the Health app, a lot of people might have never discovered that by digging a little further, you can measure a tremendous amount of health data. 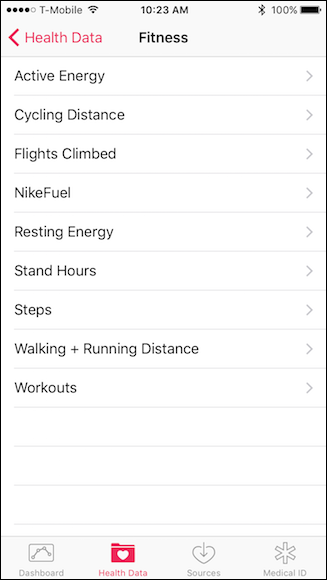 When you open up the Health app, it will display the dashboard, which will show steps taken, distance traveled (walking and running), as well as flights climbed. You can switch views on the dashboard between a day, week, month, or year. This isn’t a whole lot of data to gauge your daily activity, though. What’s more, it doesn’t display anything beyond fitness-related items. There’s a whole lot more to it than this. 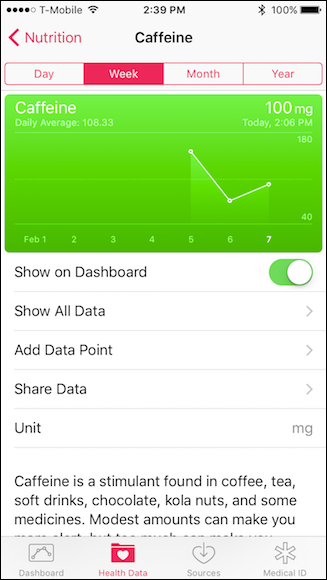 If you tap on the “Health Data” tab, you will find a vast plethora of other data you can add to to the dashboard. 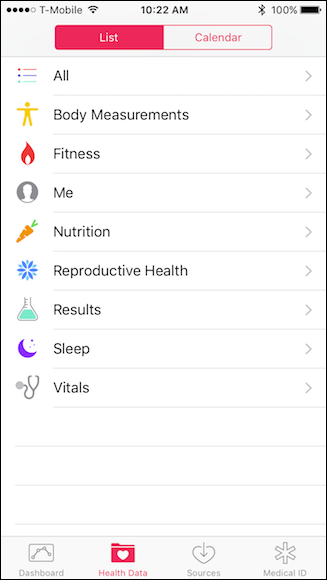 Tapping on the “All” category gives you everything you can track with the Health app. As you can see in the following screenshot, it’s quite a bit. Tapping on the Fitness category, we see there’s far more to your fitness activity than just steps, distance, and flights climbed, too. Let’s use Nutrition as an example of how to set up tracking. This category has a lot of different data points we can track. For example, if we click on “Caffeine” (something a great many of us abuse), we can track our daily caffeine intake and add it to the dashboard. 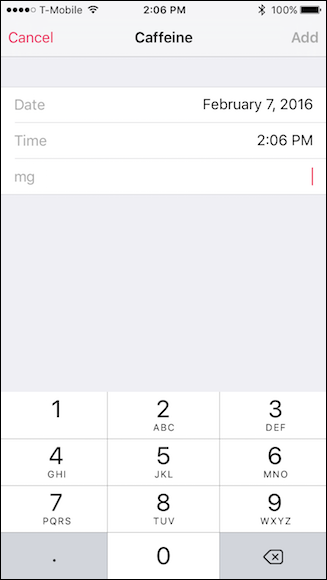 Unlike steps, of course, your iPhone can’t automatically know how much caffeine we drink a day–but we can put it in manually. And we don’t have to do it every day, either–if we forget to enter a day, we simply tap on “Date” and we can go back to whatever day we might have missed and log the amount of caffeine ingested. Once added to the dashboard, we can now easily view our caffeine intake and tap on it any time we want to add a new data point. We can do this with any metric we want to track. Some examples of this could include fitness such as cycling and workouts, nutrition stuff like fiber, vitamins, and fat intake, as well as vitals such as blood pressure, heart rate, and more. The choices can seem a bit overwhelming so it might best to figure out what you want to measure ahead of time, and then dig in. 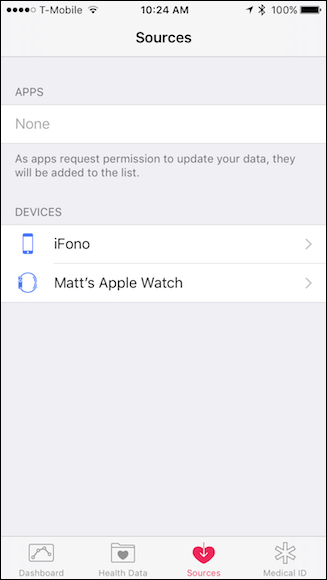 Some data can be entered automatically if you have a Healthkit-compatible device, like a fitness tracker, sleep monitor, or blood glucometer. 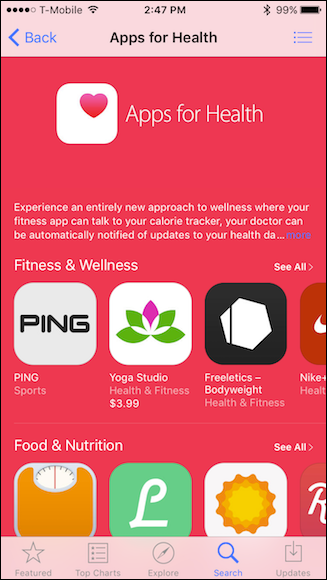 Click on the “Sources” tab, to add other apps and devices that integrate with Healthkit. 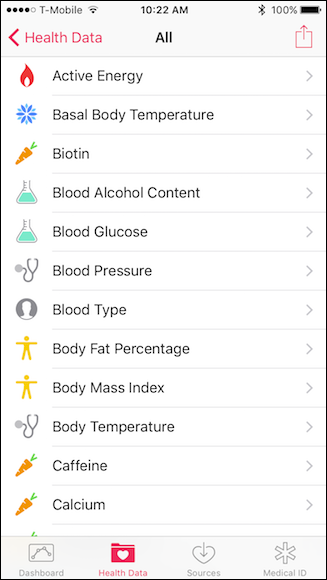 You can track all kinds of things, from body temperature to blood pressure to blood sugar, as long as you have a compatible app or device. 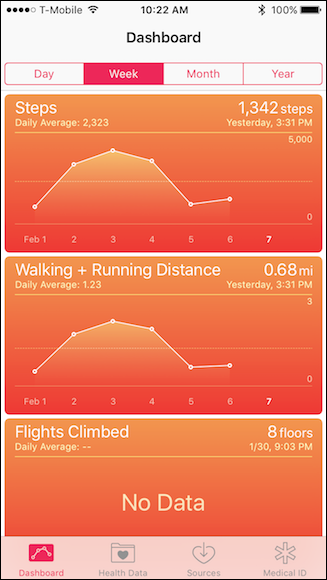 There are also quite a few apps that work in conjunction with the Apple Health app. 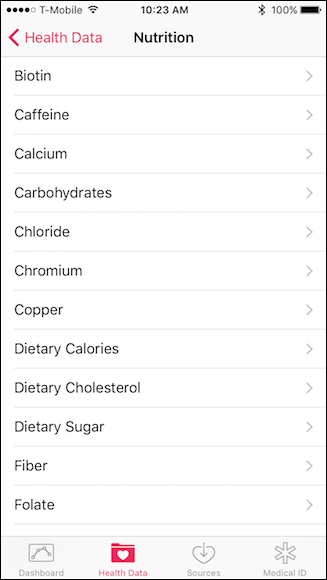 If you search for “health” in the app store, you can see them compiled in one area for your convenience. For example, you will find apps that track your runs, personal trainer apps, sleep trackers, weight loss programs, nutrition and diet apps, and much more. Finally, there is the Medical ID tab. If you have a condition, allergy, or something else that you might want emergency responders to know about, then you can add it here, and it will be placed on the lock screen. 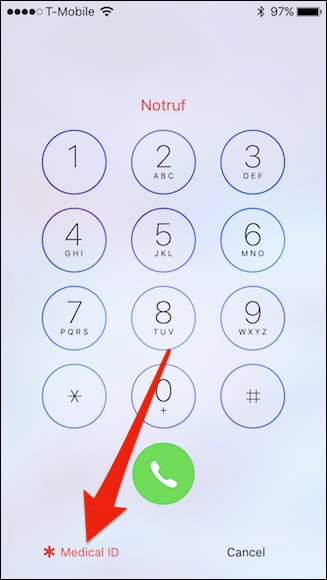 You can even add an emergency contact number so your phone doesn’t need to be unlocked to call them. 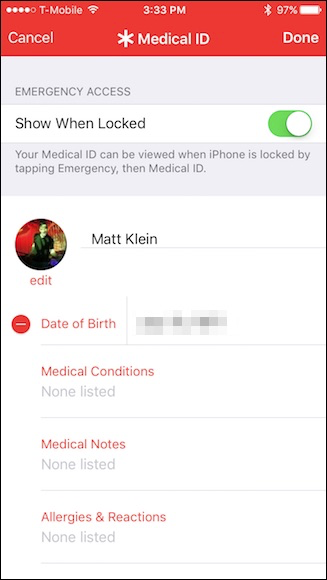 It can then be accessed by tapping “Emergency” on the lock screen, then tapping “Medical ID”. 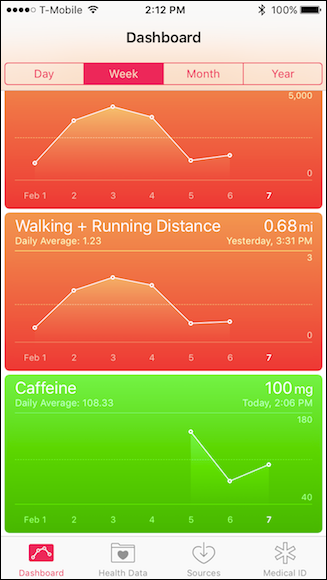 As you can see, the Health app can be an invaluable assistant for tracking your life. Whether it’s nutrition, fitness, sleep, and other data points, using Health will let you track all this and much more, so you never have any doubts about whether you’re burning enough calories or eating enough broccoli.